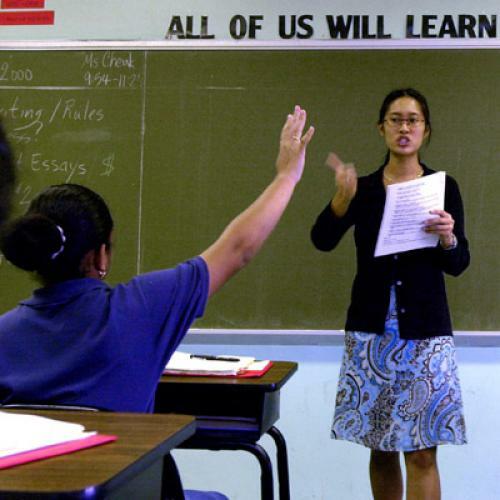 The debate over teacher pay is nothing new. And neither are the arguments about assumptions and methodologies. How do you assign a value to pensions and health benefits? How do you count the time teachers spend working outside the classroom or during summers? How do you factor in job protections and possibilities for advancement? If you want a lengthy, detailed version of the debate, I highly recommend a 2005 exchange between economists Larry Mishel of the Economic Policy Institute* and Michael Podgursky of the University of Missouri-Columbia. Mishel argues that teachers have made less than other professionals of comparable education and experience, Podgursky argues they have made more. I think Mishel gets the best of the debate, in part because I’ve seen the EPI background material from which it’s drawn, although readers should decide for themselves. But, at the risk of repeating myself, are we even asking the right question? Even if teachers do make more than similar professionals, is it enough to attract the best talent for a profession so vital to our country's future? ...we'll never attract the kind of talented young people we need to the teaching profession unless it pays far more than it does today. With starting teacher salaries averaging $39,000 nationally, and rising to an average maximum of $67,000, it's no surprise that we draw teachers from the bottom two-thirds of the college class; for schools in poor neighborhoods, teachers come largely from the bottom third. Singapore, Finland and South Korea do many things differently than does the U.S. … . These nations make admissions to rigorous teacher training programs highly selective; some also pay for these programs’ tuition and fees, and give students a salary or a living stipend while they train. In addition, government closely monitors the demand for teachers and regulates supply to match it, so that teachers who complete this selective training are guaranteed jobs in the profession. They offer competitive compensation, so that the financial rewards from teaching suffice to attract and retain top third students given the dynamics of these nations’ labor markets. They offer opportunities for advancement and growth in a professional working environment, and bestow enormous social prestige on the profession. Officials in Singapore, Finland and South Korea view the caliber of young person they draw to teaching as a critical national priority. The McKinsey researchers were careful to point out the limits of their research: Among other things, there’s no clear statistical evidence that recruiting teachers from top college performers actually improves educational results. But there’s circumstantial evidence from the other countries that McKinsey studied. Particularly if we’re going to hold teachers more accountable for results, as many reformers suggest we should, reducing their compensation would seem particularly ill-advised. *EPI gets more than a quarter of its funding from labor unions. Make of that what you will. Update: By the way, for more on the difficult choices lawmakers face on teacher pay, it's worth going back to read what my colleague Seyward Darby (the real education expert in these parts) had to say last summer.